Best of Hollywood Fringe Extension! TOP 5 Theater Unleashed nominee! "Shadley Grei has created a masterpiece! This is must-see theater!" I wrote the first three pages of MARSHALL'S LAW five years ago and then it sat in a box until I read Kristen Johnston's incredible memoir, GUTS. The story is about her battle with addiction but, more than that, it was her struggle with self-acceptance that really resonated with me. What I couldn't have imagined was that a simple Twitter exchange regarding my appreciation for her brave storytelling would actually evolve into a real friendship that would inspire major changes in my life. 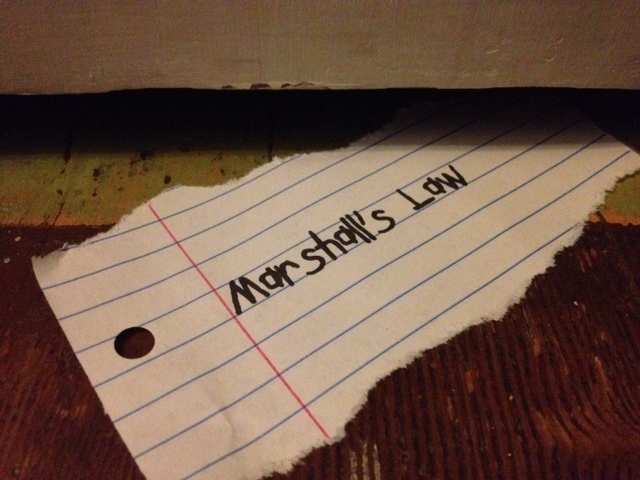 I knew that there was something about the story hiding in those first few pages of MARSHALL'S LAW that was both important and terrifying and I decided to face those fears and just write whatever I wanted to write, without giving a thought to doing anything with it. I just wanted it out of my head and on the page. So after five years of collecting dust, the first draft spilled out in a matter of hours and there was such a sense of accomplishment in simply writing 'The End.' When I showed the first draft to my friend Sarah Maloney, she emailed me the next day to say "We're doing Hollywood Fringe. I already signed us up." And so it began. I invited my roommate, the incredible Danielle Taddei, to join our madcap adventure and she brought in Dave Avcollie to direct. As fantastic as putting together Hollywood Fringe would be, the ultimate surprise was learning that we had been accepted into FringeNYC - a submission I had really only done as a dare to myself. I lived in NYC for seven years and now I would be taking a show there to perform in one of the largest theater festivals in the world. And the coolest part? We will actually arrive in New York literally on the one year anniversary of getting my first Twitter note from Kristen - the person who inspired me to face my fears and tell this story. Even for a blabbermouth like me, I find myself speechless with gratitude for the ones who are sharing, inspiring, supporting and applauding this adventure. This life is a beautiful ride.